Alongside the stockmarket, there’s another sector now starting to erase recession losses: Mergers & Acquisitions. Activity in the US has surged in the first nine month of 2014 helping uplift global volumes towards precrisis levels. In the first three quarters of 2014 global M&A value reached US$2.5tr up 52% from US$1.7tr in the same period last year, according to Mergermarket (Monthly M&A Insider 3Q 2014 edition). By comparison global M&A volumes have hovered around $2.3 tr following the 2009 crisis, so we have already covered that ground in three quarters. It seems that 2014 will end strong contrary to 2013 when the US government shutdown slowed the market. By comparison in 2006-2007 M&A spiked to $3.7 tr. We have actually predicted this breakthrough in our last year’s post (M&A 2013 Activity Update, the Middle Market and Critical Success Factors) by analyzing US GDP, stockmarket and economical cycle patterns. It seems that at least in the last couple of cycles M&A breaks out towards the end of the cycle while GDP growth stays strong and the stockmarket starts to level out. As we noted last year, “looking at the latest two economic cycles, the fact that we’re four years in the current one, the economy keeps on growing and the stockmarket is breaking new highs could one bet, just even by looking at the graphs(below), that M&As will come back with a bang in 2014 or most probably 2015?” Admittedly there’s a heavy US weight on this argument but then again North America is the largest M&A market and hence barometer of global activity. In any case there’s no need for a question mark anymore. Based on that, we can very well be looking now at a few good years of M&A activity, assuming that nothing happens to end the trend prematurely. The discontinuation of QE, robust corporate profitability and sound balance sheets all point towards that. We can expect the M&A boom to persist even as stockmarket growth tapers off or even reverse since M&A activity to some extent lags behind it. M&A may even persist during the first years into a downturn when companies rush to acquire weaker competitors. Main drivers behind M&A have been buying resources or market share to consolidate presence. In a tepid GDP environment this is preferred to organic growth. Access to technology and IP play also a part especially in internet and pharmaceuticals while resources and consolidation is mainly a driver in energy, consumer, pharmaceuticals and telecoms. Another recent motivation has been US tax benefits arising from inverse transactions and headquarter relocation although this practice has attracted attention and was criticized by the US Treasury. The main however factor behind the M&A explosion is the return of large transactions involving listed companies same as in the 2006-2008 boom period. The difference this time around is that the main driver is strategic investing rather than LBOs and PE activity. The highest M&A activity has been reported in North America rising to $1.2tr from around $950bn the same period in 2013, ie a 25% increase! The region’s comparative attractiveness increased both for foreign and domestic investors, something precipitated by US$ strengthening and some re-shoring. Europe, amid challenging economic conditions, has seen good growth especially in the first half of 2014 reaching $722bn in the first three quarters, 12.5% up compared to full year 2013 according to Mergermarket. UK has been leading the charts there. Asia continues to grow and gaining weight in global M&A reaching almost 19% of global value in 3Q 2014 with significant activity in China, Japan and recently South Korea. Cross-border M&A volume surged 132% so far this year to account for 39% of global activity according to Reuters (Global M&A at seven-year high as big corporate deals return), assisted to a large extent by inversion deals. U.S. cross-border M&A saw record volumes, both inbound and outbound. There were $205 bn in outbound deals during first nine months of 2014, with UK companies being the top targets. The U.S. was also a top destination for inbound M&A at $305 billion, led by Canadian and German acquirers according to FoxBusiness (Deal Frenzy: 2014 Sees Record M&A Volume). Transatlantic dealmaking i.e. that involving American and European companies more than doubled in the first half of 2014 to €128 bn, a 156% increase according to Mergermarket (EMEA Deal Drivers 1H 2014). Asian companies are also investing in the US to gain market access. Main drivers for cross border transactions are access to consumers and IP Although human capital is the primary driver for only a small number of transactions (8%) and that mainly in search of a lower cost base, it is nevertheless one of the most important considerations (25%) for M&A success. Other concerns are employee retention, cultural barriers, politics and regulatory framework. Cross-border acquirers are mainly shopping for consumers in emerging markets, resources in Africa, intellectual property in US and Japan, manufacturing assets in Europe or for lower cost production elsewhere (Baker McKenzie, Going Global: Strategy and Execution in Cross-border M&A, June2014). Energy has seen the highest activity both globally (18% of deal value) and in the US, followed by pharmaceuticals (16%) and then consumer and industrials. Below we briefly cover trends and notable deals in these sectors in US and Europe, which are the main focus areas of this blog. • Energy: Activity has been driven by consolidation and access to resources. The largest transaction in the energy sector involves the consolidation of the Kinder Morgan group for a total value close to $70bn. Recently Halliburton announced an offer for Baker Hughes for $35b. Falling oil prices may accentuate consolidation trends. • Healthcare has seen high activity in 2014 even though some large announced transactions were later aborted. Pfizer unsuccessfully bid for AstraZeneca ($116bn) and Abbvie for Ireland-based Shire ($54bn), at least as this is written. After a long drama Dublin based generics drugmaker Actavis succeeded in its $66 bn pursuit of promising botox maker Allergan. It has been speculated that tax benefits were part of some of these transactions and that may have affected their prospects since they cannot alone substantiate a transaction. On the other hand a much more credible driver are operational efficiencies especially when it comes to realigning business lines. For example Bayer AG bought Merck’s consumer business for $14bnn and Eli Lilly bought Novartis’ Animal Health division (€3.9bn). Other than that Walgreen acquired UK’s Alliance Boots for $24bn to expand internationally and Actavis bought US’s specialty producer Forest Laboratories (€16.8bn) in its quest to grow. In the medical device sector Medtronic Inc bought Dublin based Covidien Plc (€34bn). Apart from large deals there’s also activity in the lower end of the market, especially with biotech companies where PEs also participate. There’s also interest in the convergence of software and healthcare services to increase operating efficiencies and patient treatment. • Consumer: notable deals so far are the $16bn acquisition of US’s Beam distiller by Japan’s Suntory, increasing coverage in the premium spirits sector as well R.J. Reynolds’ acquisition of Lorillard Tobacco for $27.4 bn seeking consolidation in a highly regulated sector. Burger King proceeded with the $11 bn purchase of Canada’s coffee-and-doughnut chain Tim Horton which although denied, some speculate can offer tax benefits. Note as well of acquisition underperforming Red Lobster casual dining chain by private equity. • TMT: M&A activity in telecoms is driven by consolidation and convergence between the various TMT sub-sectors (wireless, broadband, content, cable). It’s interesting to see how technology and market developments in broadband cost and content delivery will shape up the industry going forward. Notable transactions in the US are Comcast’s proposed takeover of Time Warner Cable at $45.2 bn to build scale and AT&T’s $48.5 bn purchase of DirecTV. Let’s not also forget Murdoch’s Twenty-First Century Fox $75bn aborted offer for Time Warner. In Europe Altice acquired mobile operator SFR from Vivendi ($17bn) to complement its telecom services. Oi SA, Brazil’s biggest phone company, agreed to merge with Portugal Telecom (€8.6bn) to form a large transatlantic operator. On the technology side, high margin revenue growth is the main driver for M&As in big data, social media, mobile computing and Software-as-a-Service (SaaS) sectors. Technology and internet saw significant activity in the US notably with Facebook’s $19bn WhatsApp acquisition. • Financial services: activity is subdued compared to the years before the crisis. Regulation, legacy issues, capital restrictions have decreased appetite in banks. Regulators are wary of further consolidation in the sector. The financial technology space however is much more attractive and evolving and will see a number of deals (for example in payments and IT infrastructure). M&A is also sluggish in insurance with some activity arising possibly from international expansion such as Japan’s Dai-ichi Life’s acquisition of Alabama-based Protective Life (US$5.7bn). It’s interesting to see as well how new healthcare coverage laws in the US will play out. Finally there’s consolidation in asset management with smaller or underperforming managers in a difficult fundraising environment being absorbed. 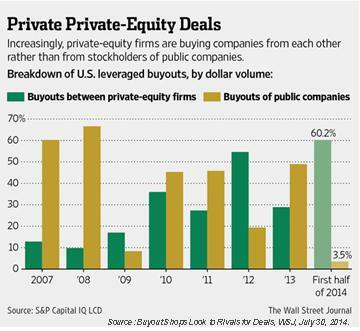 There’s even talk of acquisition between private equity companies. • Apart from the above, interesting transactions involved European cement makers Holcim and Lafarge (€29b) while Volkswagen acquired Swedish truckmaker AG Scania for €6,6bn to further consolidate its presence. As already mentioned mega deals are currently the main factor behind M&A growth. Mega deals in the US where they are more frequent, accounted for 42% of the overall M&A value in the first three quarters of 2014 up from around 28% in the years following the 2009 crisis. As a matter of fact, mega deals, those of over $5b in value have reached 2007-2008 boom levels, another indicator of the M&A market returning to precrisis territory. Average deal size in North America in Q3 2014 is at its highest since Q2 2007 at US$371mn, mainly due to some high value transactions (Mergermarket Monthly Insider 3Q 2014). Mega deals are less frequent outside the US though. Average deal size Europe and Asia is generally smaller. In the first nine months of 2014 average deal size there was almost 40%-50% below the US. We have a specific interest in middle market transactions in this blog. Although the mega deals are taking up the spotlight, there’s large volume of deals taking place in the background with significant value created or lost and alongside significant effects for local economies. Middle market deals offer room for significant value creation as we argued in our past posts and require significant input by management and advisors to bring fruit (Private Equity 2013 Update and Success Factors for Value Realization). Furthermore a deal considered middle market or even small by US standards might actually be a mega deal in another region and by that attract much more attention by local regulators and communities so have to be approached by increased level of diligence and sensitivity, reminiscent of that for mega-deals. For that special attention and M&A advisory requirements we do not view middle market deals from a US size standpoint in the global context. Well experienced M&A advisors can make all the difference between success or failure in the context of cross-border transactions both in the pre-acquisition and post-acquisition phase in the same way as for highly visible mega deals. Total value of US Middle market deals in the $250-500m range amounted to $54m during the first half of 2014 compared to $70m for all 2013. In the higher $500-2bn bracket value reached $143m in the same period in the first nine months of 2014, compared to $233m in full year 2013. So activity here is satisfactory even if not at the same level as for larger transactions and off course there’s a high volume due to smaller deal sizes. Certain sectors maybe more represented in middle market M&A such as consumer products, business services and manufacturing while mega deals are more concentrated around healthcare, energy and tech, even though mid size deals also take place there involving niche players. Deals here can be driven by value creation, consolidation (you may call that scaling up), succession or financial distress. There’s significant room for value realization in the presence of experienced strategic investors or operating partners. For that, specialized funds with a middle market focus have lately been setup. PEs are more keen in the middle market especially in niche subsectors in industrial, business services and technology. For more information on middle market M&A and value creation you can refer to our past posts: M&A 2013 Activity Update, the Middle Market and Critical Success Factors, Private Equity 2013 Update and Success Factors for Value Realization, Middle market cross-border M&As set to grow. Even though the loss of the spotlight to mega deals, the overall trend is positive in middle market and deals are becoming more expensive. Multiples (EV/EBITDA) for the $50-250m went from 6.5 in 2010 to 8.5 in 1Q2014 another sign of market health (Axial Forum, Valuation Inflation: Middle Market Multiples on the Rise, John Slater, Focus Investment Banking, July 9, 2014). Multiples in larger middle market transactions ($500m to $1bn) have risen to 12x in 3Q14 according to Factset (US M&A Trends & News Oct 2014). The outlook is positive for middle market considering among others the exit planning for the many baby boomer business owners in this part of the economy. Other drivers are consolidation, changing demographics and consumer tastes, technology, debt financing, PE exits, globalization and value creation as we have covered in the past. Activity in the private equity space has not followed the overall M&A market’s explosive growth. The first half of 2014 saw 432 buyouts in North America for US$80bn total worth. That was a 13% decrease from in H1 2013 (US$92bn) according to Mergermarket, but then again last years there were a couple of mega deals that made the difference. Apart from large deals, those over $1b, the bulk of buyouts are valued at less than US$100m, so we are really talking middle market here. As a matter of fact that makes more sense as we covered on past posts (for example Large Private Equity Deals-that 800 pound gorilla). Most of the PE focus is on consumer, TMT, biotech and manufacturing. It’s worth noting that much of the latest PE activity is not in buyouts but in working through the backlog of prior investments. According to Mergermarket PE firms are having difficulty to find trade buyers to pay the premiums necessary for sellers to recoup boom-era investments (EMEA Deal Drivers 1H2014). Because of that, as we noted last year, holding periods have increased to six years compared to around three in 2007. You can also refer to our last year’s update for more information about PE trends: Private Equity 2013 Update and Success Factors for Value Realization. Secondary offerings are the most common form of exits nowadays, contrary to the past. Seventy-three percent of PE manager in a 2014 poll expect to exit investments through secondary buyouts in the next year. More than half of respondents either plan to or expect the industry to sell to a strategic buyer, with 39% choosing IPOs (Global Private Equity Outlook 2014-2015, Duff&Phelps, Shearman &Sterling, Mergermarket). The landscape has changed in PE investing. Although capital is available one has to prove its merits by bringing returns. Working through sourcing inefficiencies, financial engineering or IPO exits are not enough to generate alpha. Value creation has become more important. In this sense a secondary offering might make sense when the buyer has experience in a particular sector. Actually there’s even talk about outright acquisitions of PE firms as well. Outside that however the sector’s outlook is positive. Based on the previous poll PE managers expect increased activity in 2014-15. On average, cross-border transactions are expected to make up 30% of activity. There were no large private equity transactions in 2014, such as those for ketchup maker HJ Heinz or computer company Dell in 2013. Actually most of large transactions were secondary offerings. On the buyout side we can note Red Lobster’s acquisitions by Golden Gate Capital from Darden Restaurants ($2.1bn), First Data’s by KKR ($3.5bn), Ortho-Clinical Diagnostics’ and Industrial Packaging Group’s by Carlyle for $4.2bn and $3.2bn respectively (Preqin Quarterly Private Equity Update 1Q, 2Q 2014). Another interesting development over the last years is that private equity companies now have to fair value their portfolios on a continuous basis for reporting purposes. PE managers were not used to this level of scrutiny in the past. This, apart from creating a lot of work for valuation professionals and back offices, it is also a source of frustration for deal teams who have to support book values many of which were made under better times. According to SFAS 157 (a.k.a. ASC 820) under US GAAP as well as IFRS 13 under International Accounting Standards these equity investments should be recorded at market values, when listed or based on comparables listed companies if not and in the absence of both conditions on financial modeling. That’s where the fun begins. Market values were considered unreliable during the big recession, the theme then was “market dislocation”. Finding comparable companies may sound simple in theory but in reality not many companies are really the same. Although they may operate in the same sector they may differ in product lines, profitability, leverage or other. In fact much can be said and many adjustments made, hopefully well-indented, in the process of selecting a reference sample. Finally, as a last refuge one would revert to financial modeling usually cash flow models. Although this approach is ordinarily used in M&A deals and security analysis, quite justifiably so as it captures future benefits and conceptualize business paths and aspirations, it was initially faced with skepticism in the context of fair value reporting. That is may be due being a novice in the traditional compliance space and because it extensively relies on business assumptions that are open to manipulation or difficult to be verified and substantiated for compliance purposes. In any case the market is adjusting to that and it may be another motivation behind secondary activity besides the fact that funds have a certain horizon, they are setup and closed to make room for new capital raising and new focus as market opportunities change. Outlook: M&A world is looking up! We are expecting M&A growth to persist in 2015. After all, as we mentioned last year “as optimism keeps settling in among at least the investment community, this is an environment that buyers will feel comfortable or even compelled to make a move or otherwise feel pressure for stock buybacks and dividend payoffs by activist investors”. We’ll stick to that reasoning. As a consequence we expect significant demand for M&A and management consulting professionals. Interesting to see how this play out with the market pretty much doubling up quickly, coming from a leaner, lower headcount period. M&A professionals are not only necessary but also critical for the execution and success of a transaction. They carry out the deal structuring and execution and then the due diligence, financial reporting and post merger integration. Noone wants to spend significant time and money only to get tangled with unseen liabilities and unrealized synergies; and this happens more often than not as we have covered in the past. Consulting professionals are also important in identifying and carrying out performance improvements, compiling strategic plans, monitoring and executing integration and reporting while assisting management teams through transition. But the jobmarket is not only improving for M&A professionals but across the board; it’s only that this rebound has been slower compared to previous US recessions. Lower unemployment and increased labor confidence is reflected in the numbers of people switching jobs and in consumer spending. According to the latest US Labor Department data the number of people who quit their jobs jumped to 2.75 million from 2.5 million which is the highest in more than six years while US companies had accelerated their hiring. More than 5 million people were hired in September 2014, the most since December 2007 when the last crisis started to unfold. Off course the overall decrease in unemployment, doesn’t capture differences across skill levels and industries or long-term unemployment and underemployment. However, gradually, increasing labor participation will lead to income improvement and consumer spending. Figures in this area are also looking up. Off course this trend will persist as long as not interrupted by unexpected developments. Challenges to the global economy are seen for example in Europe and Asia. We just prefer to stay optimistic for the near term for this cycle.